Getting outside for 30 minutes a day doesn't have to be a chore! Make nature play part of your families routine and soon your 30 minutes of outdoor time will be your favorite part of the day! See below for some ideas of things to do outside! Also look for quarterly #ICANPlay30 emails with seasonal ideas for outdoor play and events! Don't forget to print your #ICANPlay30 pledge certificate and post it up in your home to remind yourself of your commitment! 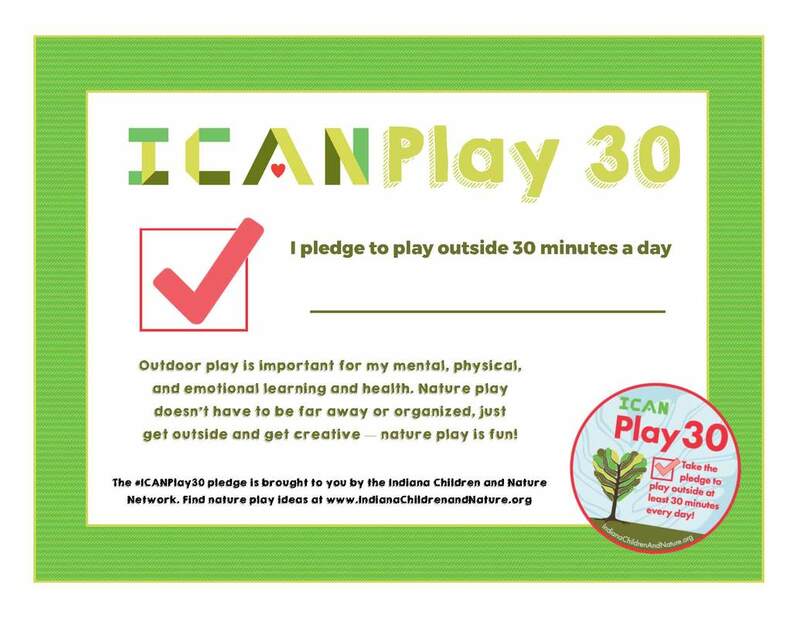 When you play outside, use the #ICANPlay30 hashtag to encourage others to make the pledge and get outdoors! ​Promotes Social Skills - The University of Missouri-Kansas' School of Education found that outdoor play fosters "social, emotional, and cognitive competencies" in kids, including strengthening the language and communication interactions between young children who play together. Improves Vision - A study published by the American Academy of Ophthalmology found that kids who spend time playing outside are at a reduced risk of developing "myopia," or nearsightedness. Researchers found a child's chances of developing myopia dropped by two percent for each additional hour spent outdoors, per week. Follow us on Pinterest for great nature play ideas! ​Increases Attention Span - An estimated 6.4 million children between the ages of 4 and 17 have Attention Deficit Hyperactivity Disorder (ADHD), according to the Centers for Disease Control and Prevention. Studies have shown that green outdoor settings appear to reduce ADHD symptoms in children, which includes the exposure they get to natural settings like parks. Reduces Stress - In 2014, researchers from the University of Colorado teamed up with educators from Maryland and Colorado to study the effects that green schoolyards had on children's stress levels and resilience. In the study, kids who played outside found "peace away from stresses in the classroom and daily life." ​Increases Vitamin D Levels - The American Academy of Pediatrics says that vitamin D offers us several health benefits, such as strengthening bone health and helping to prevent diabetes and heart disease.